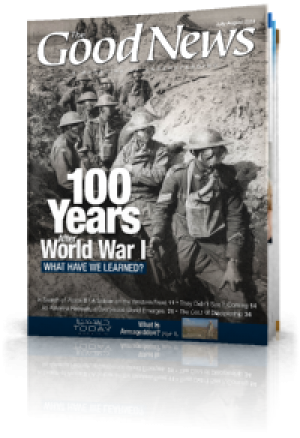 The July-August 2014 edition of The Good News considers the devastating war that begun a hundred years ago can be an exercise in nostalgia and academic history. Only a few people alive today can even remember this war in their earliest memories. For we who take a moment to reflect on what happened, let's be sure to take away a lesson that helps us understand our present world: History existed before our birth, it marches on now, and decisions made by people long ago and far away continue to impact our lives today. 2. 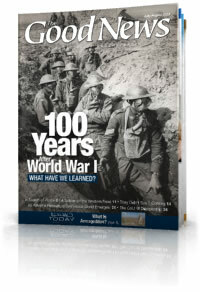 100 Years After World War I: What Have We Learned? 11. Is God's Temple Under Construction? 13. Follow Me... Discipleship Will Cost You - You! 18. Current Events & Trends: Moscow eyes Moldova next? 22. 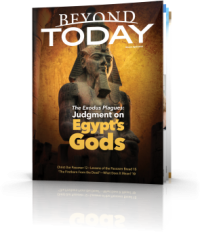 Questions and Answers: In the May-June issue, the article "Will I Go to Heaven When I Die?" states: "How does Jesus Himself describe death? He doesn't say that people who died immediately went to heaven or hell at death. He simply compares it to sleep." 23. Questions and Answers: Statements in the article "Will I Go to Heaven When I Die?" 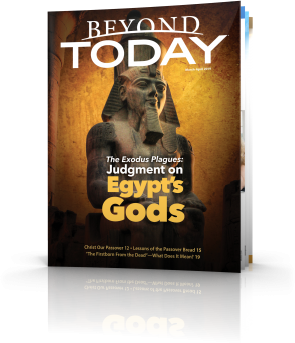 in the May-June issue aren't totally accurate about going to heaven or hell at death.